2012 saw an exciting trend as halo engagement rings gained popularity. This year, the fascination for these rings grows as designers introduce variations on the halo motif. Exemplifying elegance, the motif’s identifying feature is the halo of sparkling diamonds encircling a center stone. The genius of this design is that the surrounding diamonds emphasize the beauty of the central gem, often highlighting its cut, clarity, and size. Taken overall, the ring exhibits a dreamlike feel, almost like an artifact from a classic romance. Halo rings are more than a fad. The design has been around since the Roaring 20’s, serving as a testament to the creativity of jewelers and craftsmen of the art deco era, long before celebrities like Natalie Portman or Gwyneth Paltrow sported their rings. This was a decade of opulence – a fitting home for the halo ring. The Great Depression aided in the decline of the halo ring, giving rise to more basic settings. Recent high-profile engagements, including Prince William of Wales and the Duchess of Cambridge Kate Middleton, added to the rush of interest in halo settings. The Prince presented the Duchess with the engagement ring of his mother – a striking halo ring with a sapphire center stone. Other notable celebrities with halo rings include Carrie Underwood, Katherine Heigl, Molly Sims, Nicole Richie, and Mariah Carey. Their rings adorn the walls of Facebook profiles and Pinterest pages. 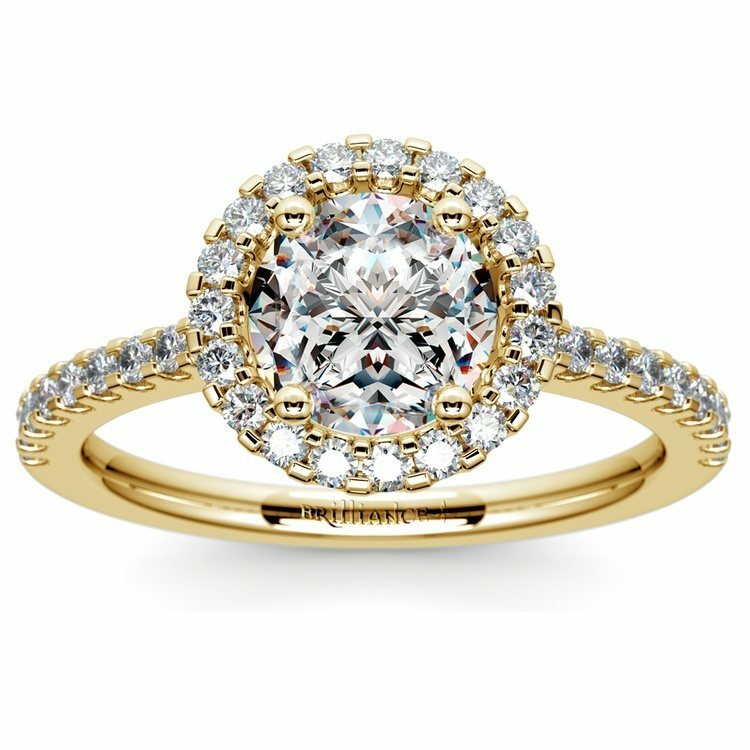 There’s more to halo engagement rings than a fashionable trend. Aficionados are drawn to them because of their clean geometric shapes. The design is the perfect complement to Princess, Oval, Asscher, and Round stones. In the end, appreciation of the halo engagement ring boils down to its majestic structure, reminiscent of a bygone age. We may have our modern day conveniences and practical approaches to everyday life, but who says you can’t have a bit of whimsy every now and then?